13-V green school calendar has 13 months and begins midyear during the months of May, June, July, August, and September. The months run down the page, each one in a single column. 13-V prints in color- the weekdays are white, weekends are green, and non-days are gray. The header has the word Calendar and the date. The font face used is Garamond, so these will coordinate with the planners Portfolio and Garamond. Having 13 months, these calendars are suitable for mid-month year-rounders. The calendars begin in the months of May, June, July, August, and September. 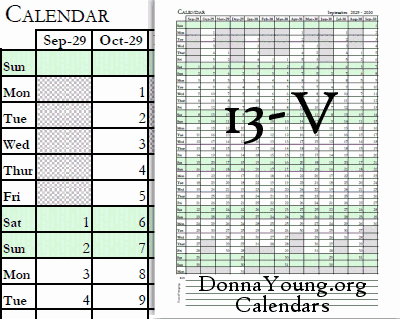 13-V calendar does not begin with January. If you need a similar calendar that begins with January see Matrix 12. At the bottom of the calendar is a ruled space that is labeled Key. You may ignore the space being used for keys and use it as notes instead. Key: Keys are abbreviations for your most commonly noted items that you add to the calendar dates. "S," for instance, could stand for "Sick Day." "A" could mean "Appointment." "M" could be used for music lesson, etc. This calendar is new beginning with the school year of May 2010. Once the calendar becomes available on the site-cd, it will date through to the school year 2025-26. Garamond Planner, also called the High School Planner, is a large set and includes most of the types of sheets that you will need. Files are included in these formats: doc and PDF. Portfolio Planner is a small set with the basic types of sheets. Files are included in these formats: doc, rtf, PDF., and a few typeable PDF.